Images and selfies dominate our perception of beauty. Rania Alhallak, A Writer, TV Host and Actress, currently lives in London, UK. She has been working in London for major networks such as Discovery, CNN and Cartoon Network. The night had begun to invade the City of London as I left my workplace to make my way towards the subway. The streets that I walked into at the city centre had transformed into something like a carnival. The small coloured lights flashed off the trees, as they climbed off the pavement, announcing the commencement of Spring. Likewise, the coloured roses transformed into basin, surrounded by columns of electricity. They had risen again in their gardens and down the sides of the walkways, while music bands were distributed on street corners that were mainly occupied by people of all shapes, sizes and genres, in the largest area of this gorgeous landscape. Among all of the people, I noticed a beautiful, young couple who appeared to be aged in their twenties. The young man lifted his phone above in preparation for taking a ‘selfie’ with his girlfriend (as it seemed to me). He was holding her intimately with fiery passion, whilst she was holding him in a state of avid adoration. Evidently, out of curiosity, I kept gazing in their direction as the loving couple had a finished taking many pictures. Immediately after their periodical exposure, they began to debate in a hushed tone, however, their voice rose slowly and resulted in the girl crying loudly before withdrawing, keeping him standing in exasperation and bewilderment. This scene was a clear representation of dozens of scenes that I have experienced. When people take selfies, they appear to be joyous, only in reality the images hide the truth of resentment and frustration within them. 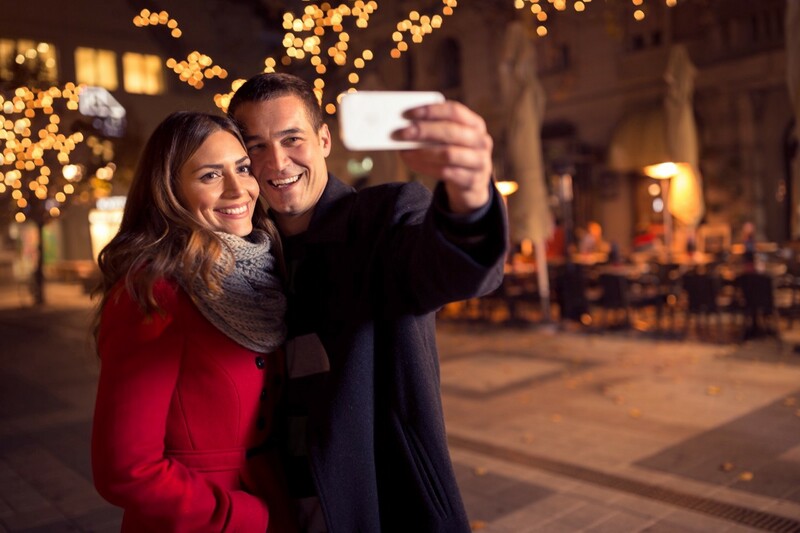 Many people (especially young people who are known to be at likelihood with each other), are turning to dearest friends and loved ones when they take selfies together. It’s a common practice and a very fashionable action in this day in age. Nevertheless, we need to ask ourselves an important question; do some of us pretend to love each other in front of the camera or do we wish we were truly happy in reality as we appear in this arrangement of pixels? Perhaps, the selfie is our way of responding to the irresistible pressures from the society to always look beautiful and happy. In pictures, people demonstrate everything; from love and happiness to health and peace — but in reality, they are unhappy, lonely and suffer from complicated problems. Of course we cannot derive this, seeing that there are some people whom hold near-perfect pictures match their reality. Many of us also suffer from the obsession of becoming more socially accepted in our selfies, we adjust our images using computer software such as ‘Photoshop’ to make us look like we are printed on a typical magazines cover. It’s like saying, “Hey look at me! See how much I look good and happy!” This is as if we are trying to assert ourselves through the amplification of our images to be accepted by others and to strengthen our confidence. A great example was set by British TV Host, Susanna Reid when she wanted to send a clear message to her female followers on Instagram. She posted two photos of herself online and invited them to compare and contrast between the two images, in the first she appeared natural, her face looked paled and tired, but in the second photo, she looked charming with full elegance with the help of make-up and Photoshop. Her message to women was clear — to believe in yourself and not let the artificial images of women in the media affect you. Every woman has flaws. Even those who look breathtaking are dissatisfied with themselves, because they are self-aware of their ‘imperfections’. Images and selfies dominate our perception of beauty, and this is particularly encouraged by the easy sharing technologies within our smartphones and their cameras. This is becoming a global issue, which is experienced by all cultures. We are tricked by the unreal but charming images created by technology and social media platforms like Facebook and Instagram, which spur us on. We know they are fake, but we still insist on living in this illusion. Some argue that this illusion can be empowering and become a reality.